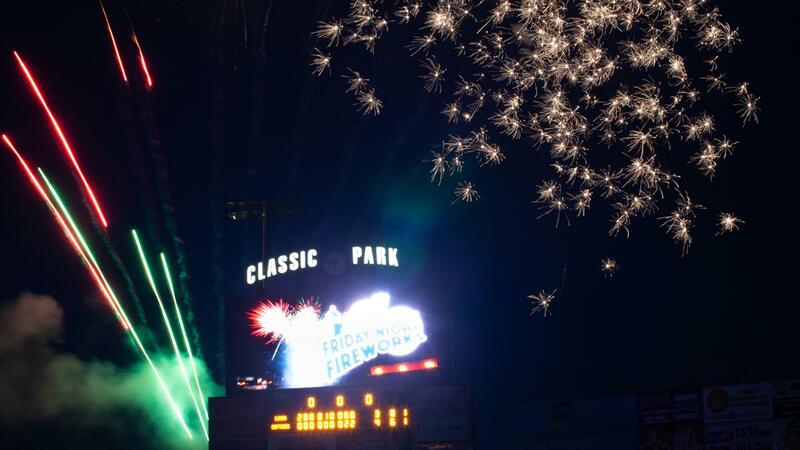 Eastlake, OH - The Lake County Captains, the Class-A-Affiliate of the Cleveland Indians, have announced plans for enhanced Fireworks shows for the 2018 season. The plan is to have two on-field shows along with a 360-degree show. The dates for the on-field fireworks shows are Friday, July 20 and Saturday, September 1. The 360-degree show will take place on Friday, August 10. The on-field shows will utilize close proximity comets, mines, and strobing effects that are very rarely seen in professional display settings. July 20 and September 1 are both 7:00 PM games. The gates for July 20 will open at 5:30 PM, while the gate time on September 1 will be 5:00 PM. The 360-degree show will immerse the crowd with effects from all angles of the stadium. The effects from the outfield will also be coming from all over the stadium. This will give fans a one-of-a-kind show that can only be seen at Classic Park. The 360-degree show is scheduled for Friday, August 10. First pitch is scheduled for 7:00 PM, and gates will open at 5:30 PM. The Friday Fireworks shows on July 20 and August 10 will be Friday Fireworks Night presented by Highland Springs, while the Saturday September 1 show is a Saturday Fireworks Night presented by Monreal Funeral Home and Cremation Service. Individual game tickets for all Captains games are on sale at the Classic Park box office, online at CaptainsBaseball.com and by phone at 440-954-WINS (9467). 12-, 20-, and 35-game mini ticket plans for the 2018 season are on sale now at great prices complete with several exclusive benefits. Information can be found at CaptainsBaseball.com.